The tesla classic is the most common model. 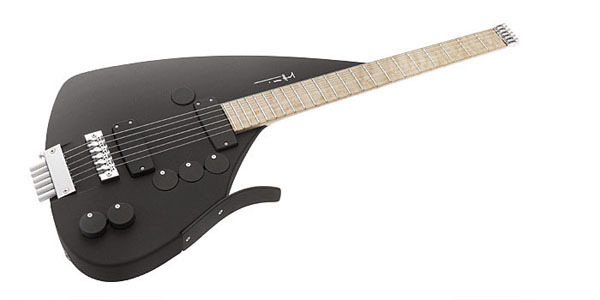 It has two pickups and three noise buttons. All tesla models have the new 2-way truss rod. The left button causes a 60 cycle hum, the middle switch interrupts the guitar signal. 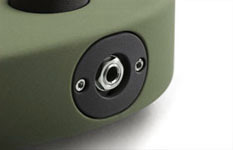 The right button activates a small microphon beneath the neck pickup which allows controllable feedbacks. In the classic version the pickups were controlled by a push-push switch. Only the bridge pickup or the neck pickup can be activated. In other words, you have two quickly accesible sounds at your disposal. All tesla versions have a robust jack from Switchcraft. In case of contact corrosion the contact tabs can be cleaned with sand paper and be bent back. The jack mounting plate is cut from an solid 8 mm (0.32 inches) aluminium plate which follows the body shape.